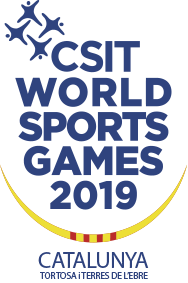 Medallists/athletes who participated during the last 4 years in seniors World championships or Olympic games cannot participate in CSIT Championships. Juniors individual: 55, 60, 63, 67, 72, 77, 82, 87, 97, 130 kg. Participants in Judo and Karate can participate as long as their eligibility criteria and sport program are not conflicting. 4 men athletes, 4 women athletes, 1 referee, 1 coach, 1 team leader (11 persons in total).